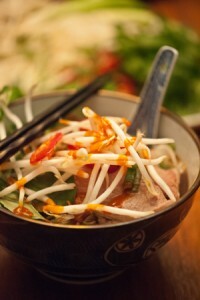 Pho (pronounced “fuh,” not “faux”) is a traditional Vietnamese soup made with beef broth and rice noodles. 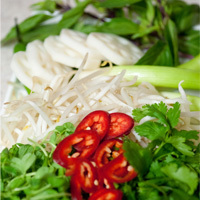 A rich, heavily seasoned broth is poured over tender rice noodles and served alongside a platter of vegetables and some hot sauce that, when combined, feeds the soul. That’s the classic preparation. 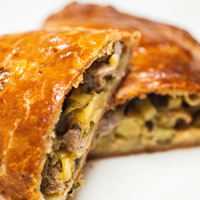 To take this recipe into Beer Cuisine territory, mixing in beer adds more complexity and rounds out the flavors. Depending on the beer style, roast, melanoidin, caramel, toffee and other malt tones compiment the bone broth, as well as the ginger, star anise and other Asian spices. 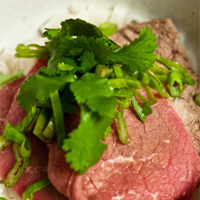 This recipe is a base that can be used as described here, or transformed using pork or lamb meat/bones for the broth to create a variation of the original pho. 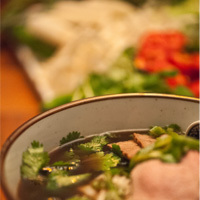 A Vietnamese soup made with beef broth, Asian spices and rice noodles to create a delicious and rejuvenating main course. 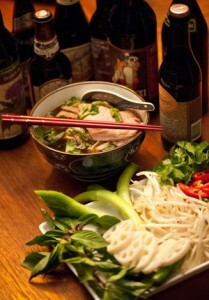 Since pho broth is one of the most important elements of the dish, take your time with it. It’s important to remove as many impurities as possible from the bones, which prevents them from being in the finished broth. Begin by washing them bones under cold water and then removing any bits of fat and blood. Place the cleaned bones into a large container that can fit in your refrigerator; cover with cold water, seal with a lid and store for at least 24 hours in the cold box. 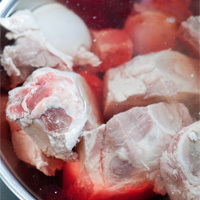 The water will extract any remaining blood from the bones and marrow, making for a better stock, with less skimming during the boiling process. Change the water every 8 hours for optimum extraction. Once the bones have soaked, drain them one last time and add them to a large stock pot, at least 3 gallons in size. Add a gallon of cold water to cover the bones, and place over high heat. Bring the water to a hard rolling boil for 3 minutes, then immediately turn off the heat and strain the bones into a colander to stop the cooking. Rinse the bones with cold water, using a sprayer in your sink, cleaning the bones and removing any residue. Set the bones aside and wash out the inside of the stock pot. Transfer the bones back into the stock pot, and cover with 2 gallons of fresh cold water. On high heat, bring the bones to a boil, then simmer. Set a timer for 60 minutes. As the bones boil, they will release some of their marrow and other impurities. Using a ladle and a steady hand, skim the top of the liquid to remove as much of the foam and scum that floats to the surface, leaving behind the clear broth. Skim as much as possible. The sooner the scum is removed, the less of a chance it has to infuse into the finished broth, potentially creating a cloudy broth. The goal with all these steps is to create a clear, amber-colored broth. While the broth is simmering, prepare the vegetables and spices. 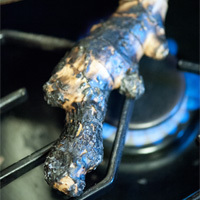 If you have a gas burner, turn the heat to medium. If you do not have flame in your kitchen, start a grill. 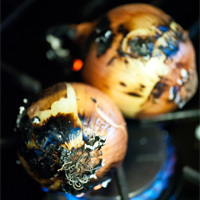 Place the whole onions, shallots and ginger over the direct heat to roast the vegetables. Turn the vegetables every few minutes to cook evenly, so they cook all the way through, while caramelizing the outside. It should take about 13 – 16 minutes. 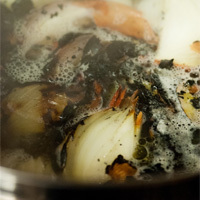 This process will develop lots of flavor and add color to the finished broth. 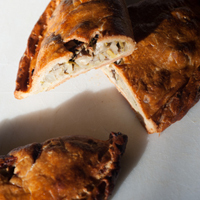 Remove from heat and let cool for 15 minutes, until easy to handle. Chop the onions and shallots into quarters. 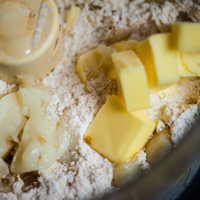 Slice the ginger on the bias into quarter-inch-thick pieces. 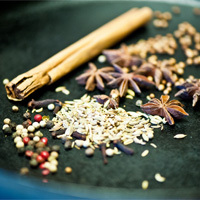 In a cold sauté pan or skillet, add the star anise, cloves, cinnamon stick, fennel seeds, coriander seeds and peppercorns. Over medium heat, stir the spices to slowly to toast, releasing their oils. Once the coriander starts to pop, about 5 – 6 minutes, and the kitchen starts to become very aromatic, transfer the spices to top the prepared vegetables. After the timer goes off (60 minutes), add the prepared onions, shallots and ginger, along with the toasted spices, to the broth, and reset the timer for another hour. After an hour, add the whole piece of beef (nestling into the bones to keep submerged), Red Boat Premium Fish Sauce and salt to the broth. 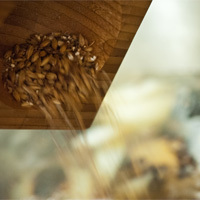 Measure out the malts into a mortar & pestle, and crush to open the husk. If malt isn’t available, 2 tablespoons of Yellow Lump Rock Candy (yellow rock sugar is traditional) or brown sugar can be substituted. Set the timer for 90 minutes (1 1/2 hours), adjust the heat to continue a gentle simmer and skim any foam or scum that comes to the surface. 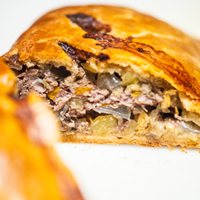 When the timer goes off, using tongs, remove the piece of beef and set aside into a container. Pour a few tablespoons of the broth over the beef, and allow to cool to room temperature. Turn off the heat and let the broth cool for 20 minutes, allowing any sediment to settle on the bottom of the pot. Using a clean ladle, skim the surface again. Then ladle the broth into a large container topped with a fine strainer (for best results, line the strainer with several layers of cheese cloth to capture any particles), leaving behind any bones, vegetables or spices. The finished volume should be about 6 quarts. The bones still have more flavor and gelatin, so note that you can do a second boil, adding 2 gallons of cold water and boiling the bone mixture for 4 hours to create another 2 – 3 quarts of broth. This will use all that the bones have to offer and give more volume to the stock without any additional cost. The broth is ready to be used at this point. 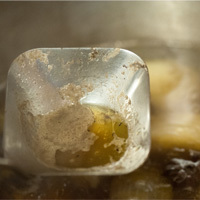 However, if you want to continue with the steps outlined in “Transforming the Broth,” you can chill the broth by placing the container into a plugged sink filled with cold water and ice, and stirring periodically until the temperature comes down to around 40°F. Cover the container with a lid and refrigerate to allow any fat to congeal and set on top of the broth. This can later be removed, producing a less greasy broth and finished bowl of pho. The broth will last 4 – 5 days refrigerated and can be frozen for later use. Place 8 cups (a half-gallon) of the prepared broth into a pot. At this point, think of it as a mother broth. 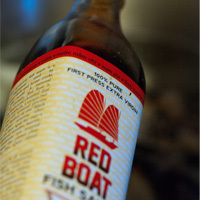 Select a beer style that will enhance, complement or contrast this mother broth. 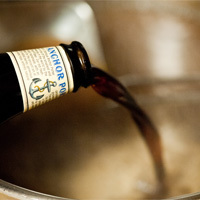 Using a Anchor Porter will bring more roast, a touch of astringency and body to the broth. 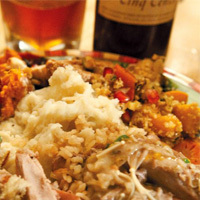 A Smoked Beer will lend more umami and accentuate the roasted vegetables. A english Stout | American Stout will add coffee, chocolate and espresso, while a toasty Brown Ale will add more melanoidin components to enhance the star anise and fennel. A Belgian Dubbel will release more complex, dried fruit flavors that will meld with the spices, really transforming the broth. Warm the broth and the beer to a simmer. Flavor to taste with salt, Fish Sauce or sugar. 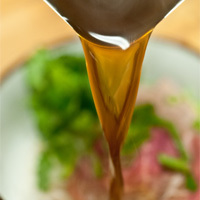 The goal is to have a flavorful, strongly seasoned broth, as all the remaining ingredients are not salted or seasoned. 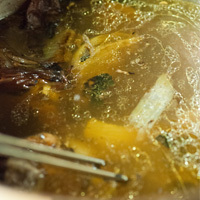 The transformed broth is ready to use. Cover with a lid to prevent any further evaporation, and keep warm over low heat. Remove the tough bottom stem from the basil, doing the same with the mint and cilantro, and place into mounds. Wash and dry the bean sprouts and, on a large platter, arrange the chilies, quarters of limes, bok choy, lotus root and pea shoots, if you want to go outside the traditional vegetable offerings. Serve with the hot sauce and fish sauce on the side. 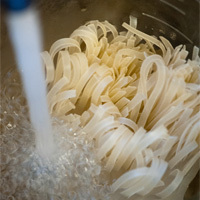 Place the dried Rice Stick Noodle into a pitcher and cover with hot tap water. Let sit to rehydrate for 30 minutes while the rest of the ingredients are being prepared. Bring a pot of water to a boil. Place the peeled and thinly sliced onion into a bowl, cover with ice water and let sit for 30 minutes to remove any harsh onion flavor and mellow the bulb. Place the beef in the freezer for about 20 minutes to make it easier to slice. With a sharp knife (a slicer if available), slice the partially frozen beef against the grain, into very thin slices. Set aside. Using a clean cutting board, slice the reserved piece of cooked beef from the stock. Blanch the soaked rice noodles for 2 – 3 minutes (looking for the noodles to just wilt, but not overcook) and portion them among the bowls. The 8 cups of beer broth will serve 4 people. Top each mound of noodles with a few slices of the raw beef, a few pieces of the cooked beef, some sliced onions, green onions, cilantro leaves and a few cracks of pepper from a pepper mill. Just before the bowls are brought to the table, ladle the boiling beer broth over the top of the meat (cooking it in the bowl) to fill the bowl. Serve immediately. Just before the bowls are brought to the table, ladle the boiling beer broth over the top of the meat (cooking it in the bowl) to fill the bowl. Serve immediately along with the Buffet and Customization Options Ingredients. this will allow your guests to personalize their pho to their taste and liking.